Why Some Silicon Valley Tech Executives Are Bunkering Down For Doomsday Journalist Evan Osnos discusses the Silicon Valley survivalists who are stockpiling food and weapons and investing in luxury underground bunkers. "They feel a sense of fragility in our politics." A guard stands outside the Survival Condo Project, the site of an underground luxury apartment complex north of Wichita, Kan. Widespread fears about the future — including concerns about politics, the economy, the environment and all-out nuclear war — have led some people to prepare for ways to defend themselves. The "survivalists" include some Silicon Valley executives, who worry about the tech future they have helped to create. 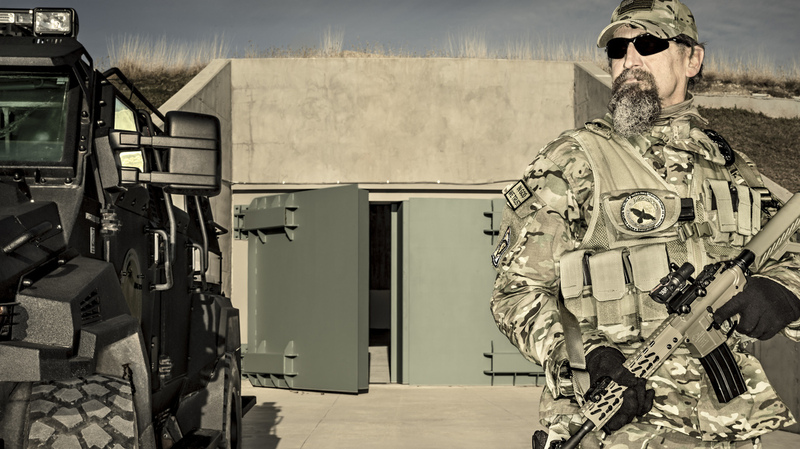 Journalist Evan Osnos, who recently wrote about doomsday prep for the super rich for The New Yorker, tells Fresh Air's Terry Gross that tech survivalists are stockpiling weapons and food, and, in some cases, preparing luxury underground bunkers. "They feel a sense of fragility in our politics," Osnos says. "Our politics have become disorderly ... and [the tech survivalists] look at it and think, 'Well, we're not entirely sure that our institutions are as sound as we've always assumed they are.' "
The Survival Condo Project includes an underground pool. While researching his article, Osnos spent the night in the Survival Condo Project, a 20-unit, luxury underground apartment complex north of Wichita, Kan., The complex is designed to be self-sustaining, with hydroponic vegetables, its own fish farm and renewable energy sources. "[The project] was developed by somebody named Larry Hall ... and what he realized was that there was a certain kind of buyer out there ... who would be willing to spend, in this case, about $3 million for an apartment underground, or $1.5 million for half an apartment," Osnos says. "Larry Hall has sold every unit in it except one for himself." Some of the things that they talk about are the kind of stuff of ordinary disaster movies, but there is some real element to it. The idea that there could be a pandemic, if the Ebola virus, for instance, had affected a much larger part of the population, or an earthquake on the San Andreas in San Francisco, that's not a completely unreasonable fear. Max Levchin who was a co-founder of PayPal, is the CEO of Affirm, a lending startup, who is opposed actually to this trend of survivalist thinking but is surrounded by it. He said what people worry about is, to use Max's word, "the pitchforks," and by that he means the idea that the sort of tension that we saw with the Occupy movement a few years ago would take on a wider, more virulent form. If you're somebody who works in technology then you got into that business in part because you tend to think about how systems fit together. As one CEO of a multi-billion-dollar technology company put it to me, "The truth is, is that our lives today are dependent on systems that are integrated, interdependent in ways that they simply weren't even 20 or 30 years ago." He's a highly rational person. ... He said, "Look, I'm not rushing out and declaring that the end of the world is near, but what I am saying is that it is," in his view, "logically rational to talk about the fragility of these digital and electrical systems, which are really second nature and largely unexamined as we go about our daily lives." One of the surprises to me was that this was not something that was occupying one political wing or another, it seems to actually draw from both sides. Traditionally most survivalists would describe themselves as libertarians somewhere out typically on the conservative end of the spectrum — they put a high premium on self-reliance, on distance from government. But there is a new element here, which is partly reflected in the success and the candidacy of Donald Trump, and that's the idea that ... in the case of Donald Trump, somebody who defies all of the conventional expectations and descriptions of politics, the sorts of experience required, the kind of standard to which he would be held for accuracy in what he says — all of the things that we used to assume would be absolutely fundamental about politics, those no longer obtain at the moment. What he was referring to was something you hear across these conversations and that's the idea that we are ultimately held together by a kind of commitment to the United States as a functioning entity. It's a sort of consensus, a belief that our politics are possible, that it's worth participating, that our institutions are sound, that the president, for instance, will abide by the Constitution, that the courts will have the say over the things which the constitution allows them to govern, so what they feel, the survivalists in Silicon Valley and in finance circles in New York who are expressing this view, is that they are worried that there's been this creeping disrespect for fairly basic institutions in American life, the things that people used to believe were sources of authority.